Rainwater Harvesting or Snow Farming? In New England we have been deluged with ice crystals measuring a record breaking accumulation of 105″ today* (2″ from the all-time record in 1995-96). With 40% of our nation under winter storm watches I am reminded of how much our lives are controlled by water. This past 30 day snowfall has caused delayed schedules, injuries from shoveling driveways and raking roofs, untold property damage, loss of work, income, our youth’s education, unsafe driving and walking environments and so on. But look on the bright side, while we complain we have no place to put it, there are thousands of the earth’s inhabitants who have NO WATER. According to the World Water Council, 1.1 billion people lack access to safe drinking water and 14-30,000 people die every day due to water related diseases. My complaints of a sore back from shoveling are quickly replaced with blessings, gratitude and a renewed vow to understand more about stewarding this resource. The picture above shows one of many snow farms in our area. 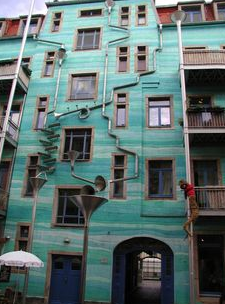 The picture to your right is one European apartment complex’s creative and innovative water collection system. The why of this sustainable best practice is clear and this week we want you to design a rainwater collection system for your apartment or home. It doesn’t have to be elaborate or large. Start small on your deck or at a gutter junction until you are comfortable before you dig a huge hole for a 10,000 gallon cistern! You could even begin harvesting snow. You may want to check water equivalents from the USGS before you start; because one inch of heavy snow over an acre can equal 5400 gallons! Just think of the money you will save and the precious resource you will have at your disposal to water your plants and your landscaping! First you need to find out how you, your condo association, apartment complex, your town, or your workplace get water, manage its usage, treatment and collection. You may want to get involved in your watershed’s stewardship. 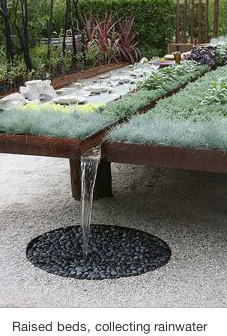 Another consideration is whether it is legal to harvest rainwater where you live. Lucky for me, where I live it is legal to harvest what lands on your property. You may want to find out about your watershed resource here or here. We observed our water footprint last week, this week we are going to harvest rainwater and recycle grey water. Purchase or repurpose a rain barrel and attach it to your gutter via a PVC pipe like one of our followers did. If you are reclaiming a metal barrel, make sure it is food grade. Some great Wiki How DIY instructions here. You can use any container, really, with a funnel to its input chamber. Or get your artist on, have a water harvest party, get the kids involved and be creative! More about grey water recycling here. * On March 15, 2015 Boston broke the all-time snow record with 108.6 inches; most of which fell within a four week period. Modern Rainwater harvesting made beautiful here. 9 Simple Things you can do to prevent storm water pollution here. The World Water Council’s 2010-2012 Strategies here. More rainwater harvesting systems here. Please tell or show us your unique water harvesting system in your comments! This entry was posted in 52 Sustainability Exercises, Sustainable Systems and tagged Rainwater Collection, Rainwater Harvesting, Snow Farming, Sustainable Systems by terrabluteams. Bookmark the permalink.